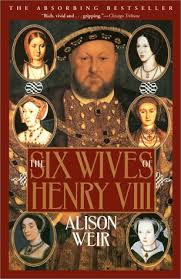 Today's featured author is Alison Weir, author of The Six Wives of Henry VIII. The e-book version hit the number 1 spot in the Teen section of the Barnes and Noble Nook store on March 28th. Alison is the biggest-selling female historian (and the fifth best-selling historian) in the United Kingdom since records began in 1997. She has published twenty-one books. Let's hear all about her e-publishing experience and success. First, tell us about your book, The Six Wives of Henry VIII. It's the story of the six queens of the Tudor monarch, Henry VIII. It's set in a court dominated by the will of an egomaniacal, suggestible king, and the power politics and ruthlessness that were the reality behind its magnificent facade. It tells how Henry’s six wives lived a hair’s breadth away from disaster – and how it frequently overtook them. Theirs are grim and tragic stories, set in a lost world of splendour and brutality: a world in which love, or the game of it, dominated, but dynastic pressures overrode any romantic considerations. In this world, one dominated by religious change, there are few saints. How did you get published: Traditionally or independently? Recently or further in the past? I went down the traditional route with mainstream publishers. I was first published in 1989, and since then I have clocked up 17 non-fiction history books and 5 historical novels. I think that the story of Henry VIII's queens has a compelling, undying fascination. Through my publishers' marketing and publicity strategies. I post regularly on Facebook and sometimes on Twitter and Pinterest, but I see my website as my main point of contact with readers. I have a broad target audience, as attendances at my many events show - from children younger than 9 to seniors over 90! Both sexes too. It was my publishers' idea to republish my books in this format. I'm delighted about sales, of course, but e-books are not for me personally! I'm writing a novel about Katherine of Aragon, the first in a series of six about the wives of Henry VIII. I've also been commissioned to write four non-fiction history books, so I'm going to be very busy over the next few years! Do you think e-publishing will ever exceed or replace print publishing? I don't believe that children should be brought up expecting to have everything delivered electronically. I speak from experience, as the mother of two children, one with special needs. They are adults now, and both read e-books. but if I was bringing them up now, I would want them to experience the pleasure of traditional books. Learn more about Alison and her books by visiting her website, or by following her on her Facebook page or the Alison Weir Fan Club Facebook page. (Other Facebook pages using her name are unauthorised and some contain inaccurate information.) She's also on Twitter and Pinterest. See the latest Kids' EBook Bestseller List for more top ten e-format authors and their books. It's updated every Saturday morning. Check back next week when my featured author will be Christopher Healy. Christopher Healy's Guide to Top Ten Success!